All aboard for DAY 10 of the countdown. 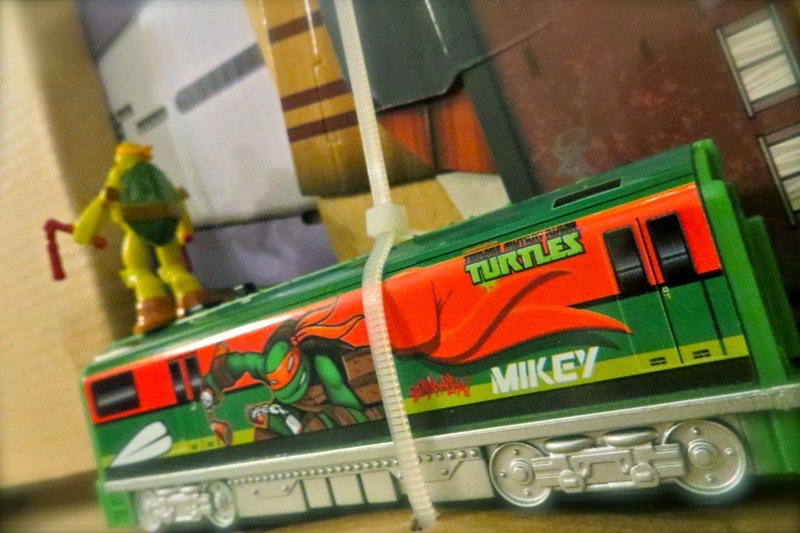 In my quest for TMNT holiday merchandise, I came across the JAKKS Pacific Subway Train Set. It seemed like a quality-Christmas find that would provide a unique, yet classic element to this year's 24 Days of Turtle. The packaging underwhelmed me. There was only one dinky photo of what the set would look like completed. Squinting didn't make it more appealing. But still, trains are a time-honored tradition during the holidays. Adding the TMNT brand on such a classic toy seemed like a win-win. I mustered up some joy and cracked the box open. The purple-colored track grabbed my attention immediately. The vivid hue is a fun contrast from the standard train sets you'd find below a Christmas tree. I slid my fingers across the purple pieces - it was all plastic. Not sure what I expected, but realizing the set was battery-operated was a letdown. Two AAA batteries are no comparison to one of those clunky accelerator dials that increase your train speed. Already feeling disappointed, I was met with another blow. This so-called Subway Train Set features nothing you'd find underground. Instead of sewer pipes and brick facades, the set includes all above-ground accessories. Who wants skyscrapers and a water tower beneath their Christmas tree? I feel like this is a mega-missed opportunity. The Turtles live in the sewers, why not make a set embracing that? One flimsy Michelangelo figure is also included. The feeble dude is mounted on top of a train. Any kid would break this off in the first few minutes of play. I'm not usually a naysayer, but I'm going Grinch and naysaying this set. The mediocre quality and missed opportunities are too much to be forgiven. It's the one thing on 2014's 24 Days of Turtle that didn't deliver holiday cheer - the dud gift that no one wants at a Yankee Swap. I didn't even bother setting up the trains. The set took a ride on Santa's sleigh back to the store for a refund. The TMNT Subway Train Set didn't bring much joy, but today's gift certainly will. 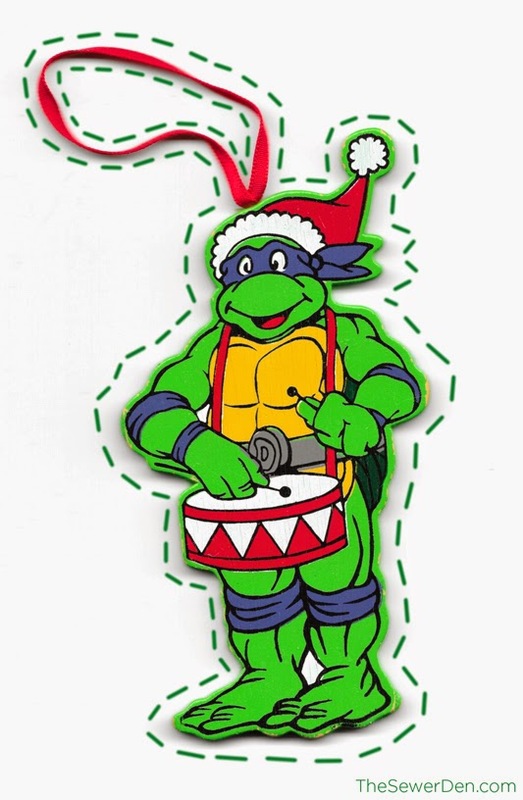 It is a scan of a wooden Donatello ornament from the original cartoon series. Print, cut-along the dotted line, and hang this brainy dude from your tree. Check back tomorrow for DAY 11 of 24 Days of Turtle for more festive fun, gracious gifts, and possible prizes! Until then, stay jolly, dudes & dudettes! I have to admit, most things I've seen from Jakks Pacific have been a disappointment. It's a wonder they get any toy licenses at all these days. Yeah? I don't know too much they've released, but I know that massive Michelangelo they put out is also pretty flimsy. Turtle Power has gone sour! See, I didn't even realize that Michelangelo was their doing. That explains a lot. From what I understand, the craptacular nature of their toys are a big reason why they lost the license to manufacture WWE figures. That's too bad it wasn't a quality set, I've still got an old Train that was my grandma's that I have under my tree each year, but at least I can fit a TMNT figure on it to ride around, guess I'll stick with that until they bump up the production quality on it. It's funny how train sets that are decades old seem to work better than something brand new. I'd love to see a pic of your trains circling the track with TMNT in-tow! Maybe I should set up my grandfather's old trains too. Sounds like a lot of fun.